La Crosse, WI (KTTC) – –Two art students from California are traveling down the Mississippi River this month in a one of a kind boat, while working on a project called Secret History of the American River People.Wes Modes and Kai Dalgleish are both masters art students at the University of California Santa Cruz, floating down the river in a vessel fit for Huckleberry Finn. “We started in Minneapolis about three weeks ago, and we’re headed down stream,” said Dalgleish as she invited a passing stranger in for a tour. 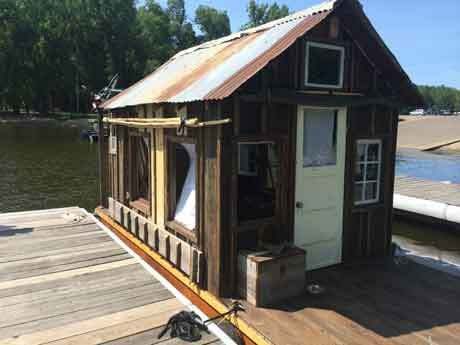 The artists inside this shanty boat are aboard for more than adventure. Wes Modes and his crew are creating an archive on water, collecting bits of river yesteryear along the way. “I’m hoping that the archive that I create becomes a research resource for people who are either doing research about the river, or maybe river people,” said Modes. Made largely of re-purposed wood and tin, the shanty’s architecture itself is a tribute to the Mississippi’s historical value. 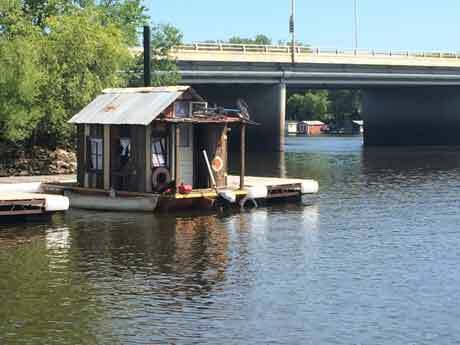 “There used to be shanty boats that lined the shores of every town and city in America,” Modes said. This shanty serves as a home and office, where the team processes video and posts journey updates to their blog. It’s also a hangout spot for a third mate, a dog named Hazel. “We thought it would be crampy and turns out, it’s plenty of space,” Modes said. Modes and Dalgleish have interviewed more than 15 people; everyone from DNR officials, to experts, to those who grew up on the rivers banks. As they’ve traveled, strangers drive miles just to get a glimpse inside the shanty walls that Wes and Kai will call home for one more week. “The boat that we’re on, a shanty boat, becomes a library and archive itself for the project,” said Modes. But long after the adventure is over, the Secret History of the American River People will float on, weaved into the backwaters and history of the Great River. Modes said they’re planning to get to St. Louis, but he’s more concerned about the stories they’re collecting than the destination they’ll reach.